How to Select The Best Skid Steer Wood Chipper Shredder Attachment? If you’re a professional contractor, or a farmer, looking to make short work of branch clearing, you need a skid steer wood chipper shredder. Of course, you first need to make sure you have a skid steer. Then, you have to find a suitable skid steer wood chipper attachment that suits your particular machine. It can seem like an excessively daunting process to find the best skid steer chipper shredder for the money, but only if you haven’t done your research. Within our buying guide, we have listed several different skid steer tree shredders, chippers, and mulchers. The aim is to give you as much information as possible, allowing you to review each top-rated machine to make an informed decision. Don’t just settle for the first skid steer wood chipper attachment you see. Make sure the features and the budget work in harmony, ensuring that you’ve got the best machine for the job. It can be difficult to know whether a particular chipper for a skid steer is going to be up to the task at hand. After all, each manufacturer produces skid steer attachments with different specifications for different jobs. That is why it’s important you know the work needing to be completed. If you’re a professional, this is essential. You want your employees to know what they’re getting into, and you want to work within a specified budget. If you’re a farmer, you need to be able to trust your machine when you’re in a paddock many miles from home. That is why establishing your work type is the first step to take. Once you know which chipper shredder is necessary, you can begin the purchasing process. The safety of yourself, and your employees, is important. Even with a top-rated machine, you run the risk of injury and even death when the machine tool is not used correctly. You can reduce the risk of injury by reading the manufacturer’s guide before you start up your machine for the first time. Most workplaces also have a health and safety plan, and this must be followed as well. Ensure operators of the skid steer with a wood chipping attachment wear the correct gear, and follow the right safety procedures. Not leaving the wood chipping attachment running when it’s unattended. Operating the skid steer with the attachment on level ground. Wearing safety gear such as goggles, a hard hat, gloves, and appropriate footwear. Ensuring all safety guards are in place and aren’t damaged. Making sure the machine is up-to-date with all maintenance requirements, as specified in the manufacturer’s guide. While you may choose to purchase a particular skid steer wood chipping attachment based on its online reviews, that doesn’t mean it will always perform at its best. It could be the best brand or model at the current time, but if you operate it incorrectly, it will be anything but the best. In order to ensure your tree shredder or wood chipping machine operates at its bestfinest, you need to pay careful attention to its specifications. Any piece of machinery, regardless of its brand, will only work within its limits. Once pushed above its limitsboundaries, you may run into efficiency issues. Most machinesry will come with a list of recommendations such as chipping capacity and HP capacity. StickRemain within those guidelines and you are sure to be happy with your chipper’s performance. If you own a skid steer, you will no doubt be familiar with how the engine works. Knowing how your skid steer operates is vital, as attachments run from the skid steer’s engine. While not all skid steer wood chipping attachments are the same, most operate in a similar fashion. A hydraulic wheel (various weights, dependent on the machine or attachment). Chipper knives (some are reversible). If you’re a professional or a farmer who has chosen to buy a skid steer wood chipping attachment, you will surely understand the maintenance this machine requires. This is because most of the maintenance will need to be undertaken on the skid steer, rather than the chipper. Of course, the attachment will need to be cleared of debris, the knives will require to be sharpened, and the hydraulic components cared for, but that’s generally the extent of it. The skid steer engine is the most important part. The oil and air filters will need to be checked or changed, alongside the fuel and spark plugs as well. Ensuring the skid steer is operating at its best will mean that your wood chipping attachment will follow suit. When you see a tree shredder attachment for sale at a really good price, you may think you’ve hit the jackpot. But, is that really the case? Have you weighed up the cost in comparison to the features? Does it have everything you require? If it ticks all the boxes, you are about to get the best deal. However, if it’s cheap because it lacks vital features, steer clear. When you buy online, you should always review each product to ensure it has everything you need. While it might seem cost-effective at the time, it could end up costing you more money in the long run. It has an over-sized, heavy-duty rotor for efficient cutting. The blades are reversible so that you don’t have to replace them as often. It operates from the skid steer’s hydraulic system. It has a 360-degree adjustable chute. It has a self-feeding hopper, reducing the risk of injury. It comes with an exceptional warranty, even when it’s used in a commercial setting. You can choose from a range of colors to match your particular skid steer. In comparison to other wood chipper shredders, it has a poor chipping capacity. 5-year residential warranty, 2-year commercial warranty. Dimensions: 80 x 57 x 72 inches. Power Source: Skid steer hydraulic motor. Chipping Capacity: 4-inches in diameter. Warranty: 5-year residential warranty, 2-year commercial warranty. QWhat is the rated RPM? QHow many rotor knives does it have? When time is money, it’s important to purchase the best skid steer wood chipper shredder for its price. This Wallenstein chipper certainly ticks that box. While it’s not the most affordable chipper for sale on the market, you won’t be let down when it comes to its performance. It operates from the skid steer’s hydraulic motor, it’s self-feeding for convenience and safety, and it even comes with a generous warranty. You will even see the benefit of choosing a color to match your skid steer. It’s easy to see this is a top-rated skid steer attachment that is becoming a favorite with both professionals and farmers alike. Check out what other people who purchased this product think about it. 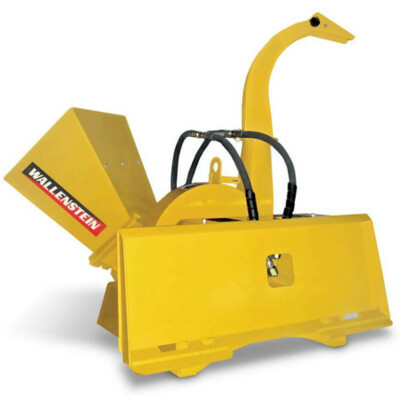 Read Wallenstein BXH42 skid steer wood chipper shredder reviews. It’s well-priced on the market. It comes with an adjustable deflector to reduce the chip flying distance. The discharge chute has a 360-degree rotation feature. The chipper disk is heavy-duty. The intake housing can either be mounted from the front, or from the right. This is not an option on most skid steer attachments. It has four blades opposed to the standard two. The self-feed feature is hydraulic-driven. The roller that feeds the chipper can be operated at various speeds. It has a remote attachment control kit which means you can operate it from a distance. Even though the feed chute is 5 inches in diameter, it will only chip branches of up to 3 inches in diameter. Dimensions: 102.3 x 48 x 92 inches. QHow tall is the feed table? QCan it act as a mulcher as well as a chipper? QWhat are the chipper disks made from? A1.25 inches of thick steel. The Bobcat 5A chipping attachment has so many convenient features on offer. It requires minimal manual labor, it has four blades instead of the standard quantity of two, and it even has dual-positioning of the intake housing. However, that’s where the benefits end. While it has everything you need to run a successful chipping operation, its 3-inch chipping capacity is exceptionally poor. In fact, you may find many hand-held wood chipper shredders have a larger chipping capacity, and are thousands of dollars cheaper. For this reason, it’s not one of the best skid steer chipper shredder attachments for the money. Check out what other people who purchased this product think about it. Read Bobcat 5A skid steer wood chipper shredder reviews. It can chip branches of up to 8 inches in diameter. The rotor is powerful and turns at 2,500 RPM to deliver maximum chipping power. It has two attachment plate positions, so the operator can choose to install it at the side or at the front. It has a 360-degree rotating discharge tube with a deflector cap. It’s made up of very durable and high-quality parts. In comparison to its features, it’s very affordable for farmers and professionals. It’s not very efficient when used for chipping small lots of garden waste. Bear Cat wood chipper shredder. 2-year consumer warranty, 1-year commercial warranty, 6-month rental warranty. Dimensions: 74 x 60 x 88 inches. Power Source: Skid steer hydraulic engine. Engine Capacity: Minimum GPM of 25-38. Chipping Capacity: 8 inches in diameter. Warranty: 2-year consumer warranty, 1-year commercial warranty, 6-month rental warranty. QWhat kind of blades come with it? A4 reversible heat-treated chipper blades with a four-sided adjustable anvil. QHow long does it take before the blades need to be reversed? ABetween 5-15 hours, depending on the kind of wood that is being chipped. QWill this attachment fit any skid steer? AIt will fit most kinds, including mini skid steers. It comes with a universal attachment plate. If you’re not afraid to open your wallet up a little further than anticipated, this Bear Cat wood chipper shredder is for you. While it can be up to $10,000 more expensive than several other chippers on the market, it’s worth its weight in gold. It can chip branches up to 50 percent larger in diameter than most other wood chipper shredders, and does so with accuracy and precision. It’s durable, heavy-duty, and built to last a lifetime. It also doesn’t matter whether you’ve got a mini skid steer or a standard skid steer, it’s almost guaranteed to suit your requirements. So, even though this skid steer wood chipper shredder is very expensive for the average farmer or agricultural professional, it will not let you down. You will be very impressed with what this brand has to offer. Check out what other people who purchased this product think about it. Read Bear Cat CH800H skid steer wood chipper shredder reviews. The chips are uniform in size, so they suit landscapers very well. It’s a good option for chipping both soft and hard wood. The chips fly out below eye level. The discharge direction is adjustable to either side of the machine. It comes with a poor warranty. The chipping capacity isn’t very good in comparison to some other models. Engine Capacity: It requires a minimum GPM of 14. QHow large is the chipping disk? QHow big are the chips? 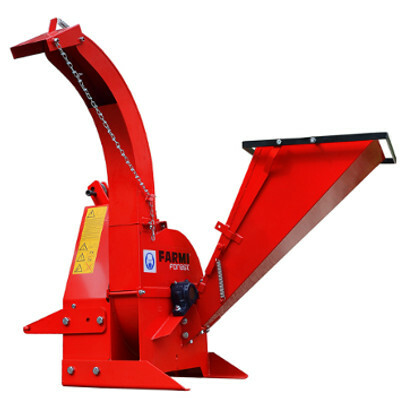 If you require a durable wood chipper shredder without all the bells and whistles, this Farmi machine is a good option for you. It’s affordable for a range of buyers, it produces uniform wood chips, and it even has an adjustable chute for convenience. The only thing missing is the self-feeding feature. However, the lack of this component enables Farmi to reduce the price significantly, ensuring it’s more affordable to a wider target market. The loss of the self-feed feature just means the operator will have to put in more manual labor than is standard for a machine of this size. However, this is a small price to pay when you consider the money you can save. Overall, this machine is one of the best skid steer wood chipper shredders for the money. Check out what other people who purchased this product think about it. Read Farmi skid steer wood chipper shredder reviews. It has a hydrostatic in-feed system. For the price, you get several good features. It’s made in the USA, which is important to some people. It comes with a generous 3-year warranty. It’s completely assembled upon arrival, a rarity when purchasing online. It comes with four reversible chipper knives which are made in the USA. The skid steer mount is universal. It can come with an optional oil cooler, if requested. The flywheel operates at a speed of 1,200 RPM. The in-feed bin folds up for convenient transport. It has a safety stop feature to reduce the risk of injury. It has a very good 9-inch wood chipping capacity. The in-feed roller is 8 inches in diameter. The discharge chute has a 360-degree swivel capacity. It doesn’t perform well when it’s made to chip dry or rotten wood. It requires a substantial amount of maintenance due to a lot of new technology introduced by Woodmaxx. Power Source: Hydraulic system from both the skid steer and the attachment. Engine Capacity: It requires a minimum GPM of 18-30. Chipping Capacity: 9 inches in diameter. QHow long will the knives stay sharp for? AWith care, a very long time. The manufacturer’s guide includes information on how to get plenty of life out of the blades. QHow big is the flywheel? QHow many knives does it have? Woodmaxx is well-known for producing quality PTO and skid steer attachments to stand the test of time. This model is certainly no different. Capable of chipping branches of around 8-9 inches in diameter, it really does meet the mark as an exceptional machine. It comes fully-assembled, is packed full of features, and is suitable for a range of industries. The best part is, the price tag certainly doesn’t reflect the value, as it’s priced very competitively. 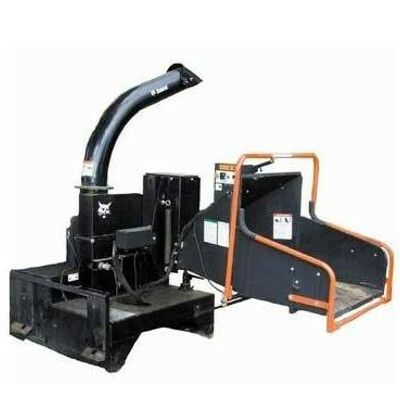 If you’re looking for the best skid steer wood chipper shredder for the money, you can do no better than Woodmaxx. Check out what other people who purchased this product think about it. Read WoodMaxx 9900SS skid steer wood chipper shredder reviews. 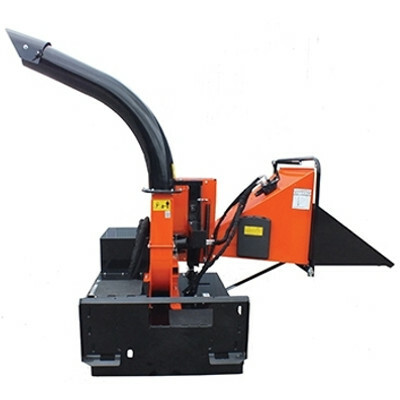 Where to Buy Skid Steer Wood Chipper Shredder Attachments? Traditionally, everyday buyers of industrial and commercial machinery had to rely on a smooth-talking salesperson. The machine may not have even been the best option for you, but it was sold to you as the next best thing. Now, you have all of the control to make the decision for yourself. If you’re looking for a top-rated skid steer wood chipping attachment, you can find the best deal when you buy online. There are so many websites to be visited, containing the very information you need to make an informed decision. The hardest part will be choosing just one to buy!